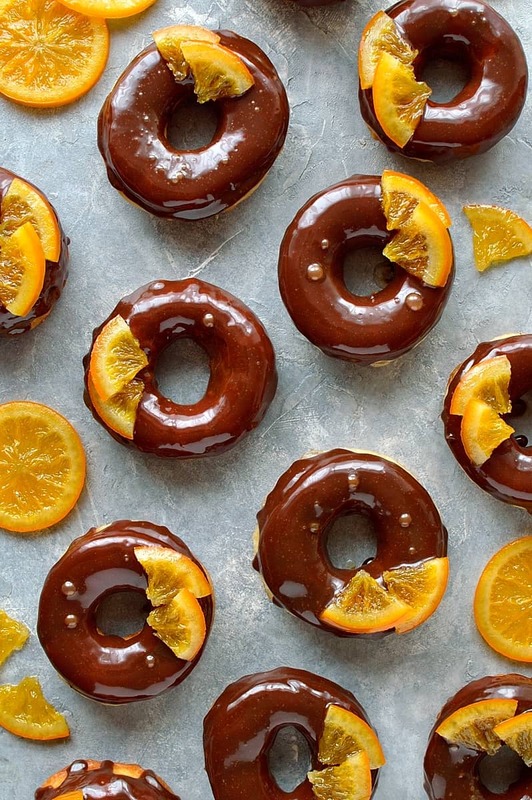 Chocolate orange doughnuts – soft, light-as-air orange infused yeast doughnuts with chocolate orange glaze and candied oranges – pure bliss! While I think that baked and cake doughnuts do have their place, they simply cannot beat the perfection of a fried yeast doughnut. Yes, they may be a little more effort to make, but you cannot deny that that effort is so worth it! Pillowy soft, sweet and so full of flavour, a fried doughnut is the pinnacle of comfort food. Here I went for a classic flavour combination – chocolate and orange. Combined with the awesomeness that is a fried doughnut, the flavours make these utterly irresistible! It is impossible to eat just one! 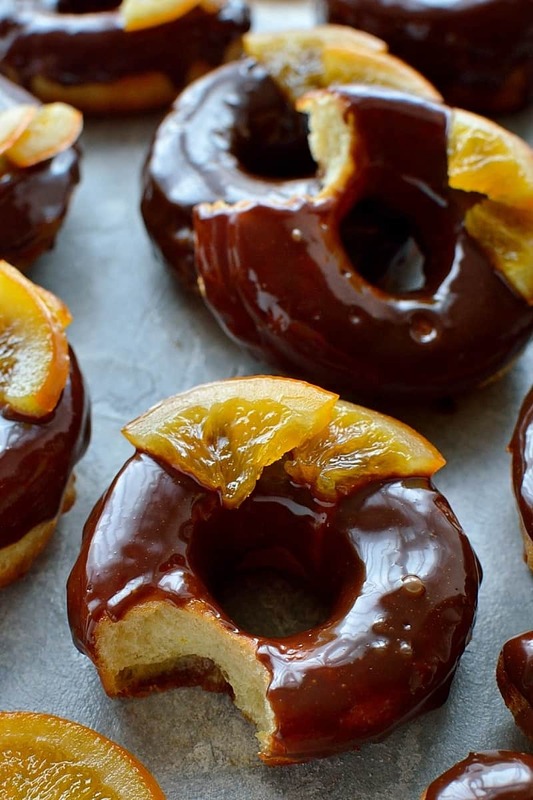 They are comprised of a soft, orange scented dough topped with chocolate orange ganache and candied orange slices. 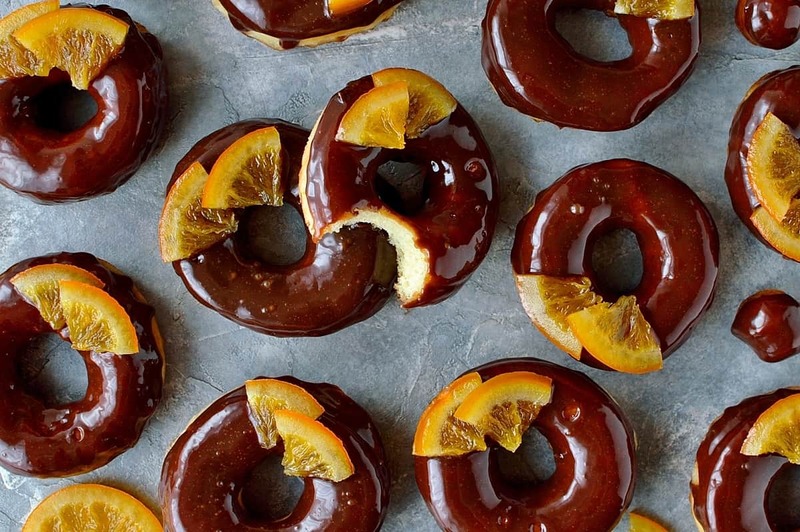 The orange slices are mostly for decoration (though do taste delicious too! 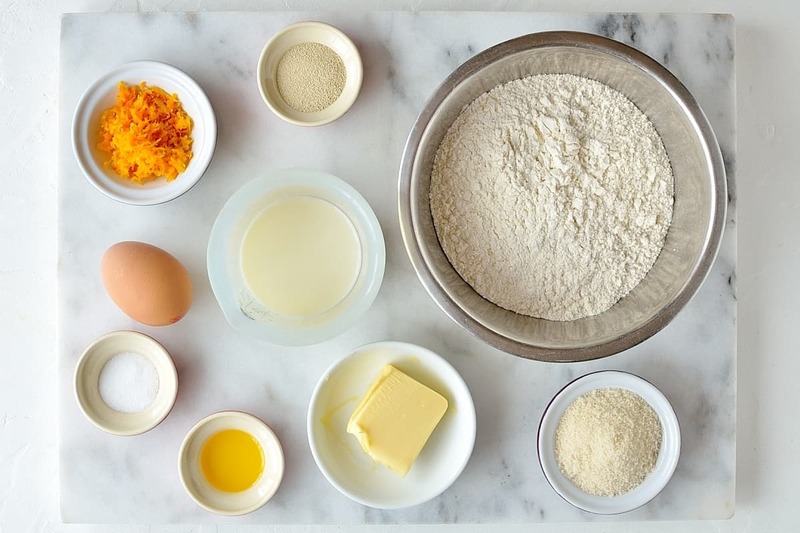 ), so you can skip making them if you like but they are very simple to do, use only three ingredients – oranges, sugar and water, and the leftover syrup is amazing on pancakes, don’t throw it away if you do make them! The doughnuts themselves are simpler to make than you might think, though obviously they do take a while. If you want to serve them in the morning then you can make the dough (and the candied oranges) the evening beforehand and pop it in the fridge to slow rise overnight to cut down on work in the morning. The slow rise gives them even better flavour too! 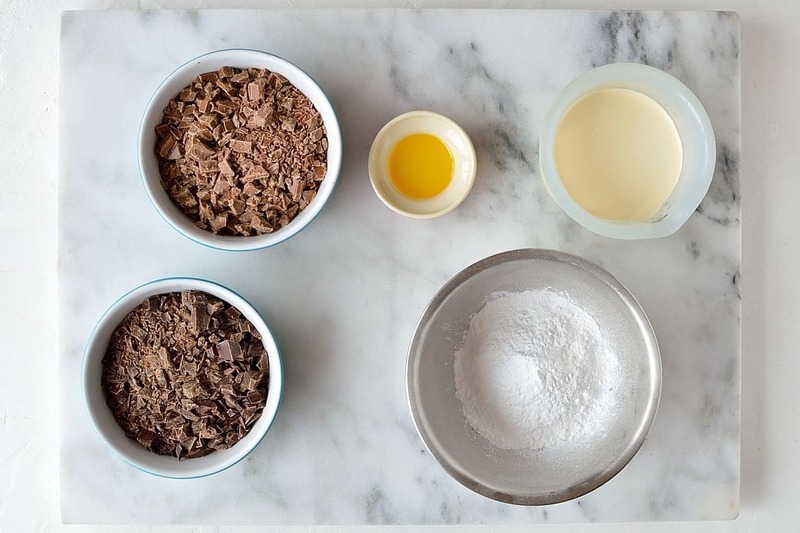 1.To make the dough, place all of the ingredients (apart from the vegetable oil) into a large bowl or the bowl of a stand mixer fitted with a dough hook. Stir until it comes together into a rough dough then knead on an un-floured surface (or in the stand mixer) for about 10 minutes until it is very elastic. The dough is very sticky but should start pulling away from the sides of the bowl/worksurface cleanly when it is ready. 2.Place in a lightly oiled bowl, cover with clingfilm and set aside until doubled in size, about 1-2 hours. You can also place the dough in the fridge to rise overnight, in which case, allow it to come up to room temperature for half an hour before rolling it out. 3.While the dough is rising make the candied oranges. 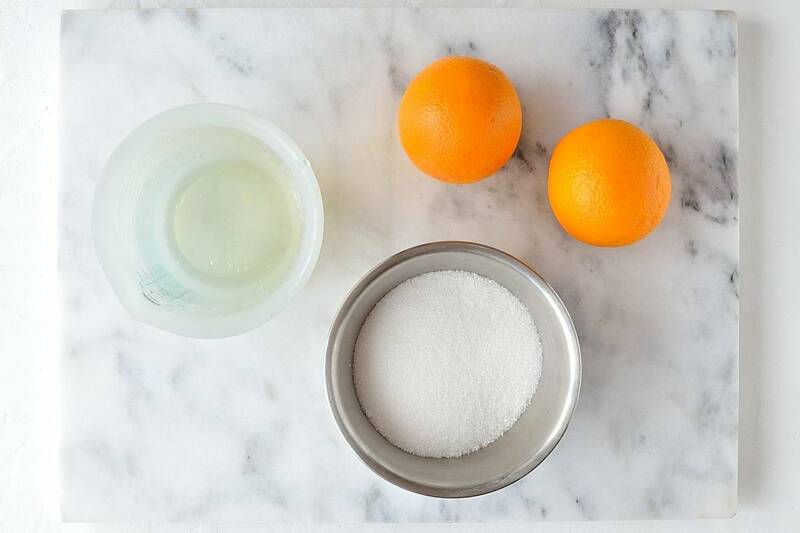 Slice the ends off the oranges then cut them into thin slices, about 1/8 to 1/4 inch thick. 4.Place the sugar and water in a pan and heat gently while stirring until the sugar has dissolved. Add the orange slices and bring up to a simmer, leave to simmer gently for 40-60 minutes, until the liquid has reduced to a thick syrup and the oranges are soft and the peel has become slightly translucent. Turn the slices occasionally to unsure that they are evenly covered. 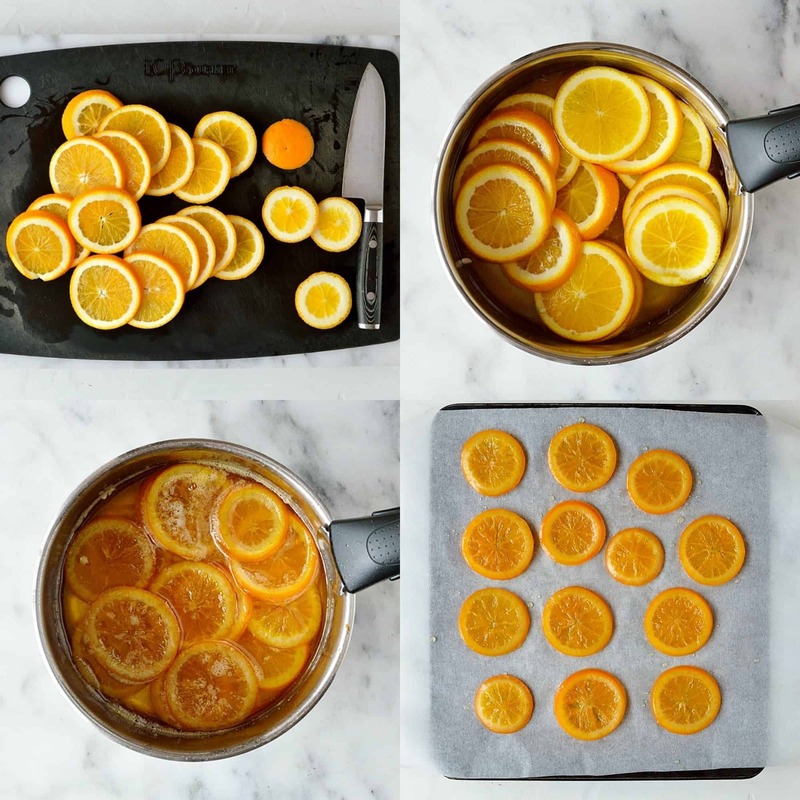 5.Remove the pan from the heat and allow to cool for a while then carefully remove the orange slices from the syrup and place on a baking parchment lined tray to dry a little. 6.Tip the risen dough out onto a lightly floured surface and roll it out to about 3/8 inch thick. Use an approx 2.75 inch round pastry cutter to cut out circles of dough, then use a 1 inch one to cut a hole out of the centre of each (I used the wide end of a piping nozzle as I didn’t have a cutter small enough). Knead together the scraps until smooth then re-roll the dough and cut out more rounds; you should be able to get about 10 doughnuts. I like to fry up the doughnut holes too so save them if you like. 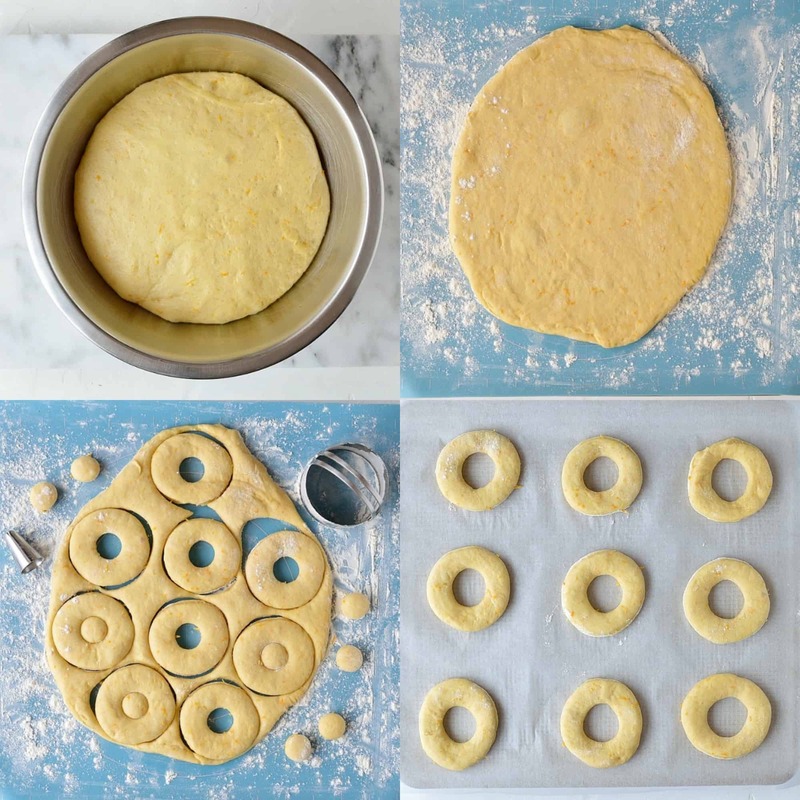 7.Spin each doughnut around your finger to widen the hole a little then place them well spaced apart on a baking sheet lined with baking parchment; cover loosely with oiled clingfilm and set aside to rise for about 40 minutes until puffy. 8.Heat a deep fat fryer or large pan of oil to 335-340F. Cut the paper around each doughnut so that each one is sitting on it’s own square of paper. Lift the doughnut on it’s parchment into the oil; the paper will come away from the doughnut and you can fish it out with tongs. I find this the easiest way to transfer the doughnuts into the fryer as they are quite soft and sticky. 9.Fry the doughnuts two at a time for a couple of minutes per side until golden, they should reach 212F inside, I use a probe thermometer to check each one is done. 10.Use a slotted spoon to lift the doughnuts out onto a plate lined with kitchen paper to drain. 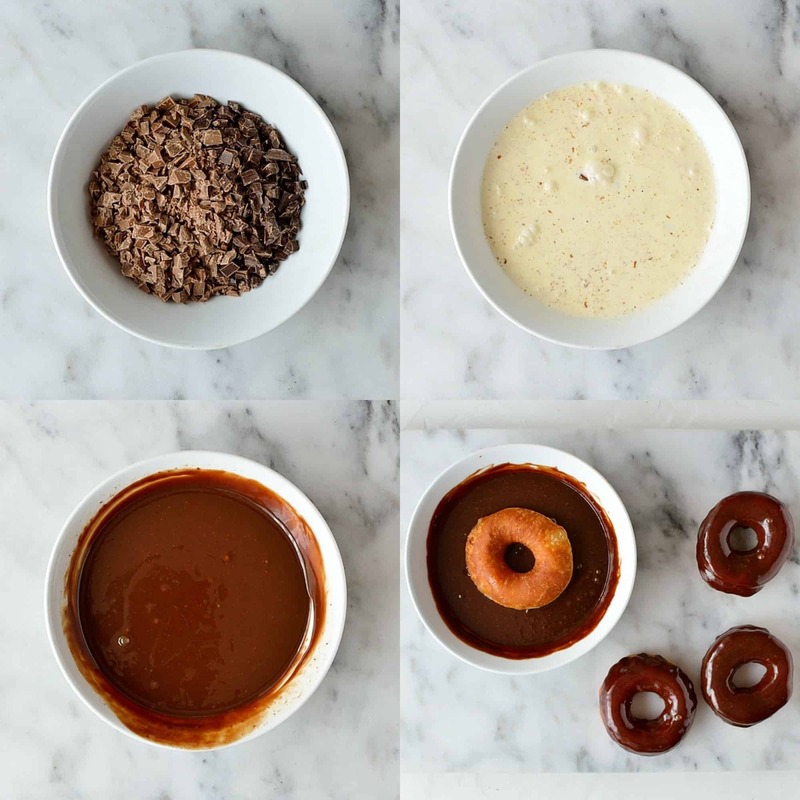 11.To make the glaze, place the chocolate in a bowl that is wide enough to dip the doughnuts in. Heat the cream and powdered sugar until it is just boiling then pour it over the chocolate; leave for a couple of minutes then stir until melted and smooth. Stir in some orange extract a little at a time to taste; I used ½ tsp. 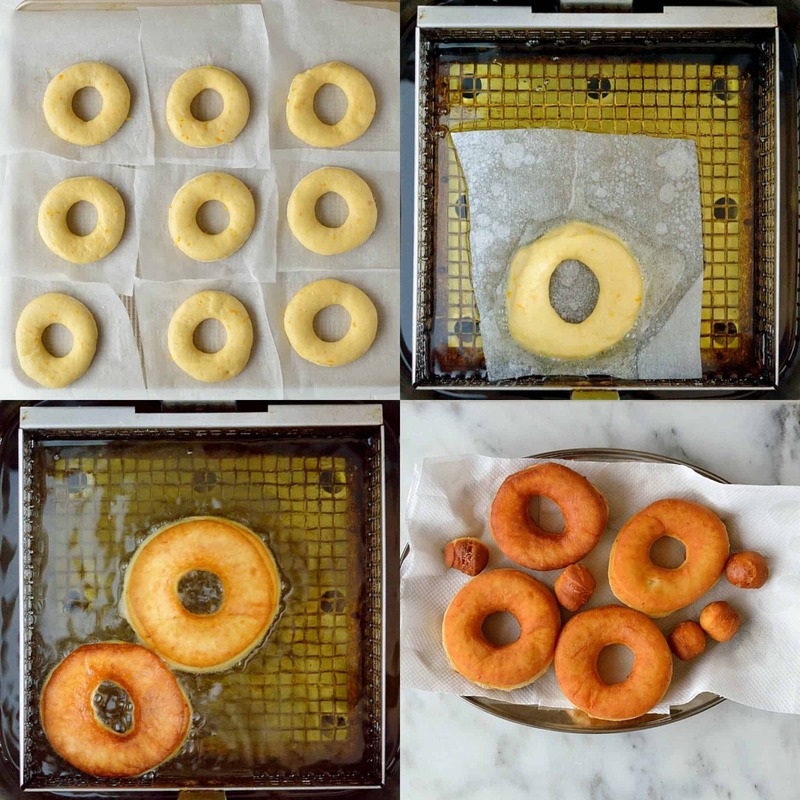 12.Dip the tops of each doughnut into the glaze, letting the excess run off before placing them on a wire rack. If the glaze cools too much and becomes too thick, you can give it a short blast in the microwave to re-melt it. 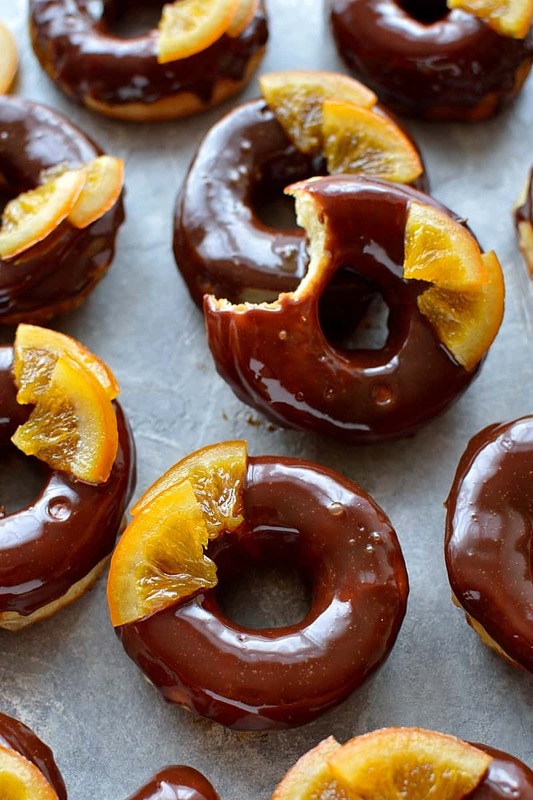 13.Top each doughnut with a couple of pieces of candied orange and serve straight away. Best eaten the day they are made.